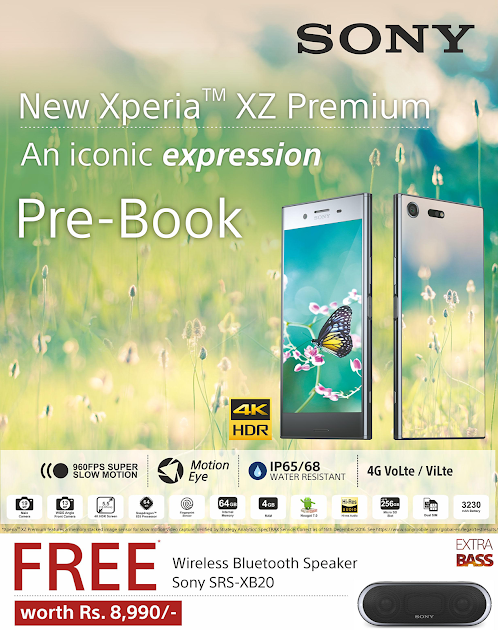 Sony Xperia XZ Premium Dual (Luminous Chrome) now available online at Infibeam! Sony’s Xperia XZ Premium Dual (Luminous Chrome) is the latest addition to the list of smartphones available on Infibeam! It is a glimpse to the technological features of tomorrow with a smooth finish and lavish design. All of these, with an exciting Pre-booking Offer! ‘The world’s first smartphone with 4K HDR display’ is just a simpler of the ways that this ahead-of time smartphone from Sony can be defined in. Have a glimpse of features of future smartphones with this new symbol of elegance from Sony i.e., Xperia XZ Premium Dual (Luminous Chrome). The never-before seen features are packed in stunning design that reflects the beauty around you. The phone is soon to be launched and has already created ripples in the market! It includes a Motion Eye Camera which has a memory stacked within it's image sensor, that enables your phone to record videos at a Super Slow Motion, i.e. 960 frames per second. The precision and details with which it captures images is beyond the capabilities of Human eye! Along with a stunning, reflective surface on both ends, Xperia XZ premium Dual also adorns a 4K HDR display bringing the vivid colours to life like never before! The phone functions on the latest QualComm Snapdragon 835 processor providing it a cutting edge over any other phone seen till date. This processor makes it capable of Gigabit Class LTE (up to 1 GBPS of download speed). Moreover, it also has an exciting feature wherein it learns how you use your phone, and adapts to give you your smartest and most personal experience yet. And it also offers useful, tailored suggestions about how to use different features making your smartphone experience smooth!